Nine patch quilts have been popular with quilters for many years. They are made out of the very versatile nine patch block. There appears to be an endless variety of these quilt designs to choose from. I have shown a few below and will be adding others over time. Subscribe to my RSS blog (in the top left hand corner)and get notification when I add them to my site. Following is a quick demonstration on how to sew a nine patch block. 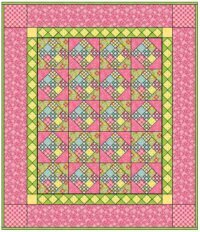 If you are new to quilting then these are great quilts to start learning how to piece a quilt together. For those of you who have now built up a stash these are great quilts to make from your stash! 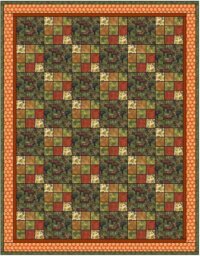 You will notice that it is easy to create a strong diagonal design by selecting limited colors (light, medium and dark) and using a regular placement pattern. 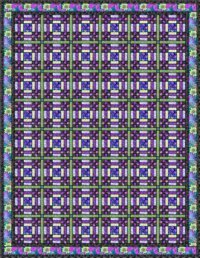 Another bonus with this quilt design is being able to alternate different blocks into the design. Again you will see I have done this in the quilts below. 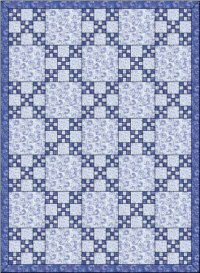 For quilting groups who are wanting to have everyone create their own block towards a quilt then this quilt works very well. You will finish up with a multi colored quilt where every block is made up of different fabrics. These quilts tend to have a historical look to them. * After making up your blocks check that each is the same size and trim where necessary before sewing them together in a quilt. * To have your sewn seams intersect well ensure you press your seams in opposite directions. This reduces the bulk. * Before sewing rows together place pins at each intersection. This will prevent the seam allowances from moving and thus keep your block edges straight.